One of my students from many years ago, James from Albuquerque, has been insisting for years in the various exchanges we have had on the old Discussion Boards that shoes are the cause of all, or most modern ills. And those of you who have read these exchanges will know that I have asked James to offer some evidence to support these claims, because (among many other things) we all know people who wear shoes, have no back or neck pain, and are “healthy” in the Western medical sense (free of disease). And (although I have not written about this) our family grew up in a place called “Putty” in NSW, and when we moved to our new property (I was 10), there was an Aboriginal family living there already (sounds like a smaller version of a familiar story). Anyhow, I became great friends with the son (Stan) and Stan senior, the father, and my father also became friends and colleagues, because Stan senior was a great horseman. And Stan senior had never worn shoes and never did the whole time I knew him. When we went mustering (in very rough country, the Mellong Ranges) older Stan often walked with us (I cannot recall why he did not ride on those occasions) barefoot all the way there and back—over 45 miles in the old measure. Can anyone imagine that? And when he rode, no riding boots could be seen—just these amazing brown feet gripping the stirrips. I mention all this because Stan had no special flexibility, as I recall—but then I never saw him touching his toes to stretch his hamstrings, either! Some here know that I was very ill and spent 10 days in hospital about seven years ago. I caught a mystery virus, and then chlamydia pneumoniae on top of that, probably while in hospital. And when I was released, I had lost 20Kg. I lay flat on my back for almost six months, and had to get up to do the rewrite of Overcome neck & back pain. When I felt that I had recovered sufficiently, I went have to the Heavy Weights Room at the ANU, and stepped under the empty Olympic bar—and did four repetitions of the full back squat. That was it, and I was back in bed, prettty much, for a week. Within a year, I had recovered fully, in a strength sense, had put on more than 20Kg, and did my best-ever front and back squats. And in the process, I had got fat! I decided that I needed to include some aerobic activity, to fully repair my lungs, and to help get rid of some of this new weight. I decided to walk, as my new home is at the base of “Mt.” Arrawang (inverted commas because the ACT is already at 700m altitude, and the top of Mt Arrawang is only 200m higher!). Now, returning to James’s claims, I feel that there is at least some substance to them, because I found myself wanting to do at least some of this walking in bare feet. This has been a revelation. I will expand on this in the next episode. Interested readers might like to look at the barefoot running sites, too. Best place to start is HERE. More later. All toes spread, the ground gripped—these are weird and beautiful! I replied: “The future of footware, in my view.” And so they are. The first time I wore these (I bought two pairs from a store in Vancouver on my last trip, in 2005, from memory) I walked up, and ran down, Mt Burnaby, a round trip of maybe 6km. Some of the walk/run was on concrete and asphalt; the rest on the kind of deep humus and rocks you find on forest trails in Canada. When I came back, I told my host (the famous Dr Wenzel) that “my body was singing; that every cell felt alive.” This is an amazing feeling. This is the image you will leave in mud. Note the other users of the path! I then walked in the second pair all around Vancouver’s downtown area—the whole day on concrete and asphalt. Amazingly, my body and feet did not feel tired at all. Usually, walking around a city for a whole day is really tiring, and my leg-length difference leaves my lower back feeling tight. Not this day. Closeup of the toe pockets; You can see where I hit a rock with the big toe. Update: I have now walked and run well over 2,000km in these ‘shoes’. I have done all my weight training and other exercising in them, too. And I have worn them around the urban environment. Simply, these are the most amazing shoes/foot gloves/’gecko grips’ that I have ever worn. I want to try to explain why. A comparison between these shoes and no shoes tells us a lot about what these things are so good; why the experience of wearing them is so pleasurable and—frankly—exciting. As an adult, when you try walking barefoot (assuming that, ordinarily, you wear shoes when walking or running) the first thing you feel is that the ground is sharp—a lot sharper than you are used to. If I can caricature for a moment, the way a novice barefoot walker or runner moves is like a cartoon character walking across hot coals: every part of the body is doing its best to pull weight away from the sole of the feet. You walk gingerly, because the soles of the feet are so sensitive. “Gingerly” means that ALL stabilisers are working, too. Foot placement is much more deliberate; it has to be. The body becomes acutely aware of the vulnerability of the feet, and uses them accordingly. In particular, watching the knees as you walk is very instructive: if, for example, you step on something pointed that is outside the midline of the foot, then the arch lifts and the adductors pull the knee across the midline to unweight that part of the sole. If the pointed object is on the inside of the midline of the foot, then the external hip rotators pull the knee to the outside of the midline of the body, again unweighting that part of the foot. This is ‘meso scale’ reaction. In the foot itself, though, somewhat independent actions are happening (and this is why only the toes of the FFs show any wear): wherever a sharp object is felt, toes on either side of it press into the earth—the net effect is that this particular part of the sole that experiences the stimulation has the weight that the body would otherwise be pressing it it relieved. This happens rapidly, in concert with the knee movement mentioned above, and the ‘macro’ scale efforts of the body to dynamically reduce the weight on the soles. This includes rapid contractions of trapezius (momentarily reducing the weight of the arms), and larger spinal flexions that have similar effects with respect to the weight/momentum of the trunk and arms. All together, a simply amazing improvement to how the body generally uses itself when running or walking in shoes. The sense in the body is that the whole body becomes involved in the action. The movement over/in the environment becomes distinctly animal-like. Finally, I want to briefly mention why walking or running in the FFs changes the way the body uses the key gait muscles, gluteus maximus, quadriceps, and the hamstring group. The first thing any new wearer notices is that the knee is never straight, or even close to straight—in this way, the quads become the shock absorbers that I believe they are designed to be. Walking down steep steps like the Grouse Grind (google this; it is an amazing “walk” in Vancouver) you notice that the foot you are stepping down from passes with under the body, and the quads lower you (or, more correctly) slow your ‘falling’); the feet and legs become expert at doing this, and I noticed in the week I was walking up and running down the Grind, my quads got noticeably thicker, especially around the knees. In climbing, you can feel the glutes working hard to extend the femur with respect to the trunk, and on flatter ground, the glutes and hamstrings ‘pull’ you forward. It is a completely different sensation to wearing either boots or shoes. And the most spectacular change to the body though I have saved for last: speaking as an ex-weight trainer, I have been amazed to see the change in size and definition of soleus; the net effect has been to push gastrocnemius further off the lower leg, making them look bigger, too. And the feet have changed the most: at least a half size bigger, due to a change in the circumference around both the arch and the forefoot. When walking on rough terrain, you can literally feel the feet ‘searching’ for the best purchase and placement. 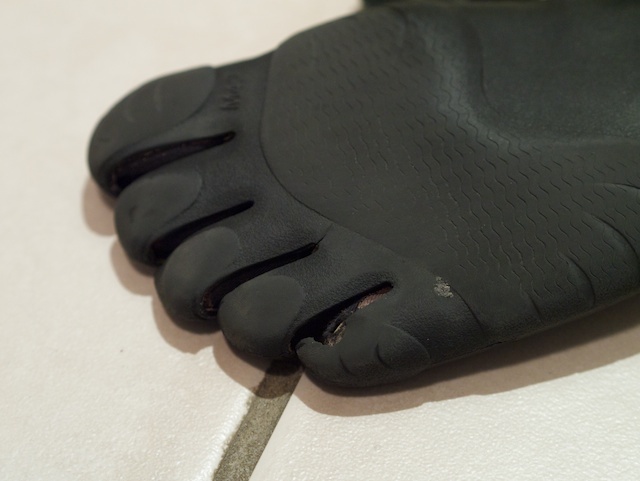 Amazingly to me, though, is that the skin on the soles has not “toughened” the way most people assume must be the case when they see me run in these ‘feet gloves’; the skin is actually softer, and all callousing has disappeared. My experience is not that the feet toughen, at all—it is that the body learns how to use and place the feet (eventually, without you thinking about it), to the net result that the feet are not hurt by the surface you are walking or running on. And in this process, the feet have become more muscular (I will add shots of the bare feet when I get back to Canberra) and when walking on stones and rock, they mould to these surfaces effortlessly. I am a total convert. Try them (I wish I had shares in the company); you will love them. Finally, have a look at this Daily Mail compendium of research into running shoes, HERE. I believe the key to what happens in the body when you walk or run in FFs or bare feet is simply that the proprioceptors in the feet are woken from their slumber (their usual state is to be insulated from their environment, and they become ‘deskilled’ as a result, and similarly all the reflexes that depend on them being ‘awake’). In my view, the injuries that runners experience can all be alleviated by some or all walking/running being done in FFs or bare feet, the changes being achieved through the re-awakening and re-patterning of dysfuctional neural patterns that result from a sedentary lifestyle, and from insulating yourself from the environmental stimulation that the body requires. I have worn nothing else over the last six years or so; more to come.